College counselors near me, near you…we’re everywhere. Teenagers are used to communicating virtually on their phones! So no matter where you are, Magellan’s counselors can provide you with personalized and professional college counseling. Parents from all over the country ask us all the time if it matters that we are based in Los Angeles. They search for “college counselors near me” and are so unsatisfied with their choices that they start looking for the best college counselor they can find, no matter where their office is based. 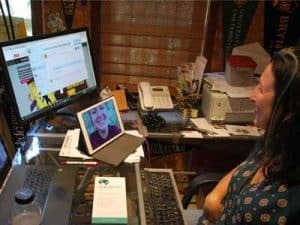 And that’s just fine, because we not only work well with students in person, but we actually do much of our counseling remotely…even for our local students just a couple of miles away. Because remote college counseling eliminates the need for Mom or Dad (or a new-driver student) to get in the car after a long school day, right in the middle of rush hour traffic. Most students can spend more time on extra-curricular activities, studying, and doing other things that make up their very busy lives. We use the latest apps and technologies that your kids are already using to set up a screen share or a video chat. It’s like we’re right there next to them, even though they might be a few miles away, or clear across the country. What makes Magellan College Counseling different is our approach. No matter where you’re located, we not only help our students with college applications, we help them prepare for the entire process. We take a measured, patient approach that begins as early as the 9th, 10th or 11th grade. An earlier start means our students spend ample time figuring out what they want from their college experience, exploring academic options and careers, and figuring out their own strengths. Then we advise them on classes and extra-curricular activities that will help them present their strongest application. Overall, our approach makes the process more organized and less stressful for both students and parents. Of course, quite a few of our clients have been told by their high school college counselors that there’s no reason to begin college counseling before September of their senior year. But when you start your college search and application process in the 12th grade, options become limited, the pressure increases and the deadlines seem to come more quickly. Our college counseling program for high school seniors gets the job done with as little stress as possible. No matter when you start your college search, whether you’re looking for “college counselors near me” or you happen to live near our Los Angeles area or Boston counselors, Magellan is ready to help you and your student get through this process – with your sanity intact. Want to learn more? Read about our college counseling services. Or take a look at some of the thank you letters and testimonials we get from our clients and their parents. You can also arrange for a free consultation and chat with us to find out what we can do for you and your child. We look forward to helping the kids you love have the college experience that fits them best.